"In a globalized world, mafia capitalists and criminal insurgents have become the new dictators and the new rebels. Welcome to the twenty-first century." I have this rather personal (and odd) fascination with understanding the whole drug cartel scene in Mexico, and it all stems from time spent there. Once in 2006 we were visiting Acapulco and just after we left there, there was a major shootout in the streets where we'd previously been riding around in a hired car. Then just this past year, we were looking forward to a great time riding horses along the palm-lined beaches of Mazatlan (one of our favorite things to do), when a series of shootings and other violent episodes made us decide maybe that wasn't such a good place to be. Off we went to Cabo instead and discovered that the drug-related violence is there as well. It's everywhere -- resort areas, main streets, nightclubs, and I've often wondered why the government doesn't do something about it. After all, especially in areas along the ocean, tourist dollars are such a huge contribution to the country's economy, and it seems like the government is shooting itself in the foot by not taking action. Whereas we used to love to go to Mexico, we look elsewhere now when thinking of a vacation. And my husband and I can't be the only people thinking like this. But now, after reading this book by Ioan Grillo, I have more of an insight into what's going on and why little seems to be getting done in cleaning things up there. El Narco is a compelling book; one well worth every second spent reading it. I couldn't put it down. 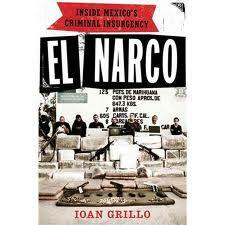 But before launching into the meat of the book, Grillo first examines the concept of "El Narco." He notes that in Mexico, El Narco is the collective term used for traffickers, but in reality the term also designates an entire culture in its own right, spawning its own music, co-opting religious icons and religions, its own clothing styles, etc., all based on the drug trafficker as local hero. It is an entire movement based in the "drug underworld," and as Grillo notes, the threat of El Narco and figuring out possible solutions is best understood by following its development. As the book proceeds, it follows the above-listed guideline to provide an incredible look at how the traffic in drugs in Mexico went from a few people who dominated the poppy/opium/narcotics market to a major insurgency and an all-out war which threatens to explode into unprecedented violence and a very real threat. The author examines US policy which basically created the birth of "El Narco," as anti-drug legislation as far back as 1914 created a black market for Mexican drugs that Americans were all to keen to exploit, and which were easy to get along the border. He goes into the formation and rise of the cartels, examining the connections between the rise of the cartels' power and the end of the Colombian primacy over the cocaine trade. Grillo also presents information that clearly links the upsurge in drug violence and the end of the seventy-one year rule of the more authoritarian PRI (Partido Revolucionario Institucional, or Institutional Revolutionary Party), and the upsetting of the system of payoffs and control that helped to keep violence in check during that party's time in office. When the more democratic system of government came to take power in Mexico, former police forces under the chiefs or caciques of local territories and former army personnel saw many in their number being arrested for human rights abuses or corruption, and many of these people began to come over to the newly-formed, paramilitary Zetas, who at first served as a militia for the Gulf Cartel, and rose to prominence on their own through new tactics of terrorization and control. There are also links between the efforts of the US government in its war against drugs and the new democratic regime that helped create the modern-day situation in Mexico. Grillo also posits that the dramatic upsurge in violence and current drug wars really began in 2004, when the Sinaloa Cartel tried to take over the Gulf Cartel traffic. The group ran up against the Zetas and their new, most brutal brand of control, including beheadings, mass killings, and other nasty intimidation techniques. The Zetas' tactics served as example to other drug lords of how to take care of their enemies; add to that Calderon's all-out assault on drug trafficking and other factors, and there's a very flammable mix that has led to the current situation. Of course, it's much more complicated...this is just a very rough outline of a central part of Grillo's research and findings. The book also goes on to explore Narco-culture (an amazing section, by the way), and moves on to discuss the very real problems and threats inherent in this current insurgency. As the author notes, there are currently seven major cartels in Mexico, and when their leaders are taken out, the violence escalates as members fight each other for the leadership positions. The police are working for rival cartels as protection and are firing on each other. And even with the US backing the Mexican government in the war on drugs, drugs are still pouring over the border. The traffickers are expanding along the border and murder rates are at an all-time high. In answer to all of these issues and more, Grillo comes up with his own ideas about a solution, one that the US government probably won't be in a hurry to implement, but it's one that makes a great deal of sense. This is one of those books that you need to read slowly and thoroughly, as politics and anti-drug policies both in Mexico and the US are tangled and rather complicated, but the author does an excellent job in making every aspect very clear. But the very best parts of this book are found in the stories of the ordinary people who for whatever reason got sucked up into the world of El Narco, even peripherally. There's the personal experiences he captures of the courageous newspaper reporters, the families of those killed in the deadly violence of the drug wars, former gang members, "sicarios" or assassins, and many other people. The brilliance of this book lies largely in Grillo's ability to get into the world of El Narco firsthand, creating a very human story, one which deals with a current threat that seriously needs to be addressed. While sometimes the information in some of the chapters sort of veer off topic and the timelines get a bit muddled, my only other criticism of this book is with some of the author's wording. For example, the phrase "severed craniums" is mentioned several times, and it took me a while to decide he must be talking about severed heads, because why would anyone wait for a body to decompose then cut the cranium off of the skeleton? But these are niggling complaints, and these little things didn't interfere with my reading at all. I would definitely recommend this to anyone who's even remotely interested in the topic. I noticed that while looking at reviews on Amazon, someone calls this book "conspiratorial," "left-wing" and "Anti-American." Don't believe it. The book is frightening in its implications, because it's all too real, but the facts are well presented and thoroughly researched. Grillo's own insights and personal contributions even convey some humor to break up what is an incredibly serious situations, and he's been covering Mexico and other parts of Latin America for years and is therefore most credible. 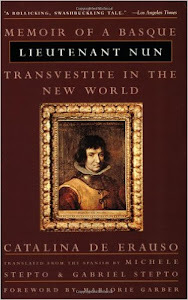 This is probably my favorite nonfiction read of the year.